During hearing on extending detention of soldier who shot wounded terrorist, military prosecutor drops murder charges. 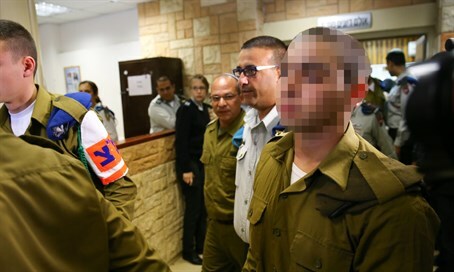 During a hearing on Thursday on the extension of the detention of a soldier who last Wednesday shot a wounded Arab terrorist, the military prosecutor announced that the murder charges that were leveled against him last Friday in a similar hearing have been dropped. Instead the soldier is being charged with manslaughter, and not murder. The hearing was held at the Qastina military court, following a similar extension request on Tuesday when hundreds of protesters showed up at the court to support the soldier. A large showing of protesters were present outside the court again on Thursday. During the proceedings the military prosecutor, Lt. Col. Adoram Rigler, said that the evidence that has been gathered suggests "serious suspicion," and therefore asked to extend the soldier's detention by another seven days, after previously getting extensions last Friday and again on Tuesday. "There were very significant developments in the last two days and currently we are attributing a crime of manslaughter," said the prosecutor, officially backing down from the murder charges. In the hearing on Tuesday, no mention of murder charges was made even though the prosecutor last Friday accused the soldier of murder. The request to extend his detention by nine days was rejected by the judge, who only agreed to extend it by two days. Likewise the judge said the evidence against the soldier is "not unequivocal," and Attorney Binyamin Malka who is one of two lawyers defending the soldier told Arutz Sheva on Wednesday that the judge's position made him hopeful the prosecutor would soon accept the soldier's account. The soldier has argued he shot the terrorist - who minutes earlier together with an accomplice stabbed and wounded a soldier - over concerns he was moving to detonate a bomb belt that was thought to be hidden under his unseasonably thick coat. That version of events was vindicated by a Magen David Adom (MDA) investigative committee.